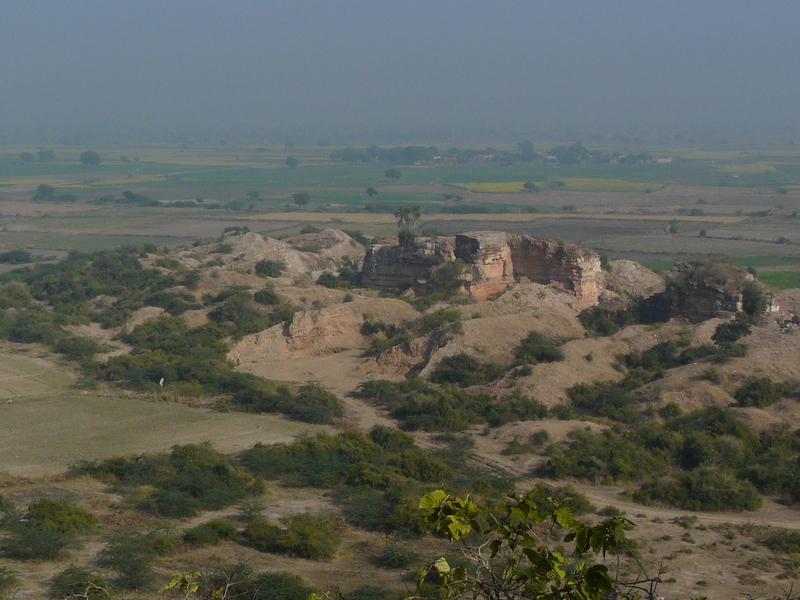 The hill of the Chausath Yogini temple at Mitaoli overlooks an adjacent rocky hill, or what’s left of it. 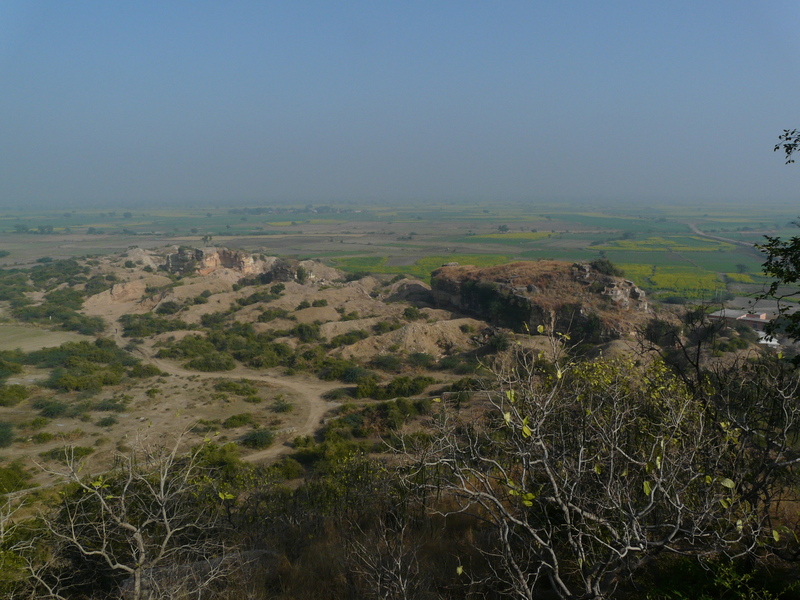 This adjacent hill has been almost entirely excavated and quarried for its stone, to be used in India’s booming construction industry. This is nothing unique to the Mitaoli hill. Wherever I travel in India to visit architectural history sites, there is evidence of the denudation of hill after rocky hill for this purpose. The drive from here to the nearby Bateshwar temple group passes through areas of similar devastation where such hills and outcrops once existed. Apparently the “mining mafia” was more of a hindrance to the restoration work in Bateshwar than the dacoits who once controlled the area. The unique and beautiful mosque at Khatu in Rajasthan sits uncomfortably close to vast stone excavation work that threatens the entire hill that the mosque is situated on. In Tamil Nadu temple sites such as Narthamalai and Kalugumalai incorporate in their name itself their position on hills (malai), but all over the state other similar hills are being lost to quarrying. The pressures being placed on natural resources such as stone and sand by India’s growing population and growing affluence, and the vast fortunes to be made in the building industry, are immense. However, the heritage of a nation is not restricted to just the material culture (such as architecture) produced by its people historically and in the present times. Heritage also includes various aspects of the cultural landscapes, and that includes the physical landscape that is inhabited by its people. These hills and outcrops that were once part of the lives of the people living around the area are never coming back once they have been quarried out of existence. Sometimes even the historical sites: temples, mosques, forts etc are themselves threatened by such quarrying, but often the hills that they stand on are saved by their presence. But that should not mean that all other hills are automatically available for excavation. There needs to be be a system in place to identify and preserve the physical landscape of some areas, hopefully large areas, as part of the preservation of our wider cultural landscapes. In my Nareshwar post I had mentioned that hills such as the Mitaoli hill in the pictures below are part of the first outcrops of India’s vast peninsular block, which covers most of the Indian landmass south of this location, emerging from under the alluvial plains that extend north from this location till the Himalayas. From the point of view of India’s overall cultural landscape, these are significant rocks, and just for that are worth preserving. Similar narratives hold true for many other local geographic formations. At the least, individually, we could try to make more sustainable choices in the materials and designs we use for our construction purposes! This entry was posted in Madhya Pradesh and tagged geography, gwalior, madhya pradesh, mitaoli, morena. Bookmark the permalink. This is really a pity. Not only because the calm surroundings of Mitaoli may be endangered, but also because the stone here seems to be full of fossils, which are now largely lost. The sand mafia in Chambal seems to be still active; on a recent visit I found the traffic on the highway blocked for hours because the sand mafia was protesting the administration’s moves to stop them!